VIRGINIA -- A Hampton woman's scalp was partially ripped off five months ago. The dogs' owner could face up to 20 years in prison. An attack by two dogs that ripped part of a woman's scalp from her head could send the dogs' owner to prison for up to 20 years. Tammy Sajdak, 34, of Hampton was convicted Wednesday of one count of malicious wounding in the May 21 mauling of her friend, Tracie Wesson. Sajdak was originally charged with aggravated malicious wounding, which nets a life prison term if convicted, but she pleaded guilty to the lesser charge. Sajdak will be sentenced on Jan. 8. Evidence presented by prosecutors was that Wesson and Sajdak were hanging out at a friend's house at 2408 West Weaver Road when they got into an argument. When things cooled down, Sajdak's husband persuaded her to leave, which she did, said Hampton Deputy Commonwealth's Attorney Matt Hoffman. But a short time later, Sajdak returned with her dogs -- a pit bull and a German shepherd -- and another woman, he said. The women jumped out of their vehicle with the dogs and rushed toward Wesson, who was standing on the porch with the man who lived in the house, Hoffman said. The women began hitting Wesson, and the dogs started biting her, he said. The dogs continued biting Wesson, 39, while she was curled into a fetal position on the ground, Hoffman said. She suffered bites to her legs, arms, shoulder and head, and the back of her scalp was ripped off. Hoffman said the man living at the house saw Sajdak and the other woman directing the dogs toward Wesson's head during the attack. The man also saw neither of the women doing anything to stop the dogs, he said. Wesson spent a week in the hospital waiting for her scalp to reattach itself. "I'm glad this day happened," Wesson said, standing outside the courthouse after the hearing. "I'm glad because she pleaded guilty, and the judge found her guilty." Although the women had known each other for about two years, Wesson said they'd never really hit it off. She said she doesn't understand why Sajdak let her dogs attack her. "I'm doing good," said Wesson, who wears a hat to cover her injuries. "I've got more surgeries and two more skin grafts, and I have to have my tissues expanded to get my hair to grow. It's going to be a four-year process, but I'm handling this the best I can." Court records show that Sajdak will be in Hampton General District Court on Nov. 15 for a hearing to determine if her dogs are dangerous and should be destroyed. VIRGINIA -- A canine accused in a James City County attack must be on the state's dangerous-dog list, a judge rules. After nearly two months of confinement at the James City County Animal Control Shelter, Bud, a 6-year-old pit bull, may finally be headed home to 3649 Marlbrook Drive in Toano. But a Williamsburg judge's ruling Friday that Bud is a dangerous dog means that his owner will have to jump through a few hoops to keep the pit bull that knocked down an 84-year-old woman and attacked her dog in August. 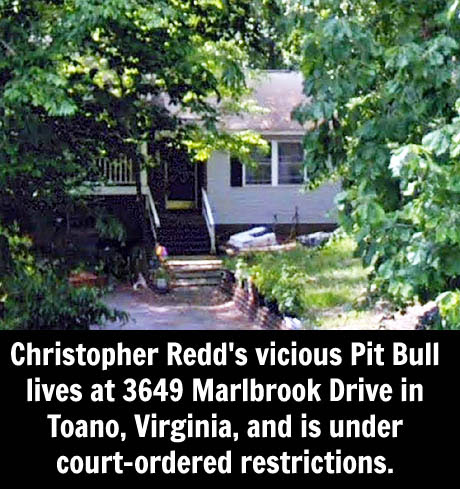 Christopher Redd, the Pit Bull's owner, didn't oppose the judge's ruling and now must comply with a state law regulating dangerous dogs. Williamsburg-James City County District Judge Colleen Killilea told Redd that he must obtain a $50 dangerous-dog license within 10 days and add Bud to the state's dangerous-dog registry within 45 days. Because Bud is now considered a dangerous dog, he must be confined indoors or in an enclosure on Redd's parents' property, and he must be leashed and muzzled at all times when out in public. Redd must also post signs on his property alerting neighbors to the presence of a dangerous dog. Police said the pit bull attacked the woman Aug. 24 on Beechwood Drive in the Chickahominy Haven neighborhood in James City County. According to an animal control report, the dog tackled and scratched the woman before grabbing and holding her 12-year-old miniature pinscher in its jaws. The woman suffered injuries to her knee, elbow and left hand, while the pinscher lost two teeth in the attack. Killilea said the declaration of the dog as dangerous was a civil matter but warned Redd that if there were future problems with the dog, he could face criminal penalties. Sara Redd, his sister, was fined $200 Friday for allowing the dog to get loose the day of the attack. Sara Redd said after the hearing Friday that she understood the fine for Bud getting loose but was disappointed that her brother didn't fight the dangerous-dog designation. She regrets what happened but insists Bud was "playful", not vicious. "At least he gets to come home," she said. "That's all that matters." TENNESSEE -- A 5-month-old miniature horse foal was one of three horses mauled by a pit bull and at least one other dog early Tuesday morning, according to Frederick County Division of Animal Control. Animal Control Officer Robert Uttermohlen went to a farm in the 11000 block of Old Annapolis Road on Tuesday and found a Welsh pony and a large gray horse with bite wounds on their legs and a foal that was severely injured, according to Harold Domer, animal control director. He said the attacks took place late Monday night. abdomen. The horse' full name is "Oreo's Pretty Little O." 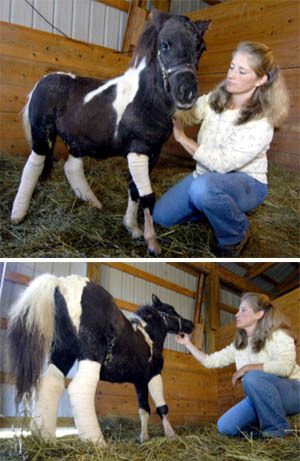 "She was ripped from head to toe," said owner Karin Walden of the foal. "One of the dogs actually jumped on (the Welsh pony's) back and bit her rump." The foal, named Dot, had bite marks and puncture wounds on three of its legs and a deep cut on its head that went all the way to the bone, Ms. Walden said. A veterinarian stitched up the leg and head wounds, but was not able to suture a deep gash on the foal's belly due to swelling and the possibility of bacteria, she said. 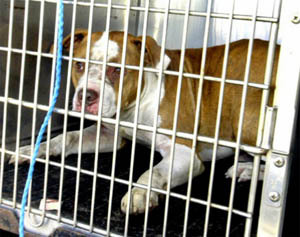 Animal Control officers captured a brown and white pit bull that was running loose in the area, Mr. Domer said. Officers set traps to try to catch another dog described as a collie mix that might have been involved. Ms. Walden knew something was wrong Monday night when she looked at her television monitor and saw another of her miniature horses doing frantic circles in its stall. The horse is pregnant and about to foal, so Ms. Walden keeps an eye on it by video camera, she said. "I ran outside in my nightgown and slippers ... There were horses everywhere!" she said. The panicked animals had broken the fence and gate to the paddock and were running loose in their field. Ms. Walden went to shut the gate and saw the pit bull and the back end of the other dog as it ran away, she said. It took her 40 minutes to bring the frightened foal back up to the barn. "It was at the very bottom of the pasture. I had to half-carry, half-push it back, uphill all the way," she said. "It was in shock. Then I saw how badly it was injured." The next two days will determine whether the foal will survive, Ms. Walden said. The other two horses did not require veterinary care other than antibiotics. 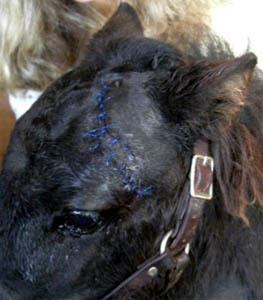 horses were attacked and seriously injured. By county law, the pit bull must remain at the Animal Control shelter on Rosemont Avenue for at least five days to give an owner a chance to come forward, Mr. Domer said. After five days it becomes county property and could be deemed potentially dangerous, he said. Right now the investigation is still open. Ms. Walden said she hopes an owner does come forward to claim responsibility for the dog. Whoever it is will pay the foal's medical bills, either willingly or by legal order, she said. NORTH CAROLINA -- Authorities say a 2-year-old boy was fatally mauled by a Rottweiler Tuesday afternoon. Sheriff Lemmie Smith says Julius Graham was staying at his grandparents' house when he wandered off and the dog attacked him. Smith says it appears the dog dug a hole under a fence and got out. Julius was taken to Lenoir Memorial Hospital where he was pronounced dead. Smith says several calls came in reporting the incident and officers arrived on scene within four minutes of the first phone call. He says when officers arrived, they found the grandmother sitting with the child. The Rottweiler was shot and killed by deputies after it started acting vicious towards them. The owners of the Rottweiler were reportedly out of town.